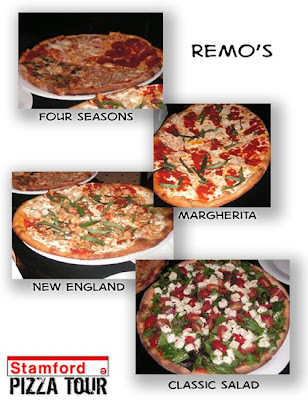 Remo's entered what seemed like the entire left side of their menu into the Pizza Tournament with an unprecedented five unique, small pizzas: New York-style plain cheese (not pictured) and Four Seasons pies, Napoletana-style Margherita and New England pies, as well as a unique classic salad pizza. Every pizza was cooked on Remo's trademark brick oven charred crust and topped with some of the freshest tasting ingredients and sauces that we've come across on the Tour. Rather than running you through every one of them, we'll just let their menu and our photos do the talking. Reaves: "Excellent sauce and crust, margherita pizza was really good and tasted very fresh." Elliot: "Fresh, fresh, fresh, superb toppings, [New England pie] was phenomenal with red sauce, like an excellent pasta sauce." Kait: "Clam pizza was the best: great taste and texture, very good crust." Scott: "Perfectly cooked, slightly charred crusts all around, very consistent. Sauce is phenomenally flavorful, toppings are extraordinary." Dan: "Clam pizza was very good, an honorable mention goes to the salad pizza, very refreshing." 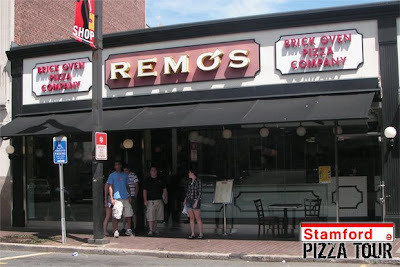 Most of the time when we were offered multiple pizzas, it was quite evident what the better one was, but at Remo's, every pie had its merits and it was almost harder to rank Remo's entries than to rank Remo's against the rest of the restaurants that day. In addition to being scarily consistent and utilizing only the freshest ingredients to make absolutely phenomenal pizzas, Remo's offered an incredibly hospitable and comfortable dining experience that we'll be sure to revisit, Pizza Tour or not.